Space, the final frontier. These are the voyages of the Marketing Department. It's 43 year mission: to explore strange new fans. To seek out new profits and new distributions. To boldly produce what no man has seen before. Unless you've been hiding in a Jeffries tube, you will have heard of the new Star Trek film, and in a move that the Grand Nagus himself would be proud of, the new toys will be beamed into your local toy store by April 19, two weeks before the film. 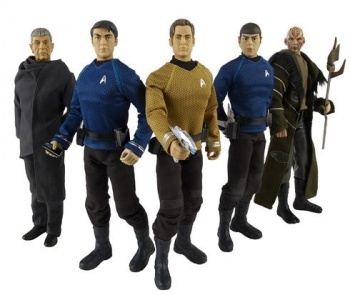 The new Kirk, Spock and McCoy will be available in three sizes, 3Â¾-inch ($7), 6-inch ($9-$10) and 12-inch ($30), with a Leonard Nimoy doll stepping through a temporal anomaly to join them. There's also a Bridge and a Transporter playset for the kids; but then there's the things that will sell to the kid within all of us. That's right, there are also Communicators, Phasers and Tricorders going for $15 each, as are seen here. For those who are more into Barbie though, Mattel have released Spock, Kirk and Uhura Barbie Dolls. And we won't snigger at you if you buy one. The film itself debuts on May 8. Live long and prosper.